There has been a cool response to President Bush's nomination of Paul Wolfowitz to be the next head of the World Bank, a key development agency. 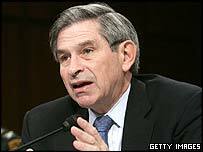 Mr Wolfowitz, 61, currently US Deputy Defence Secretary, has a reputation as a "neo-conservative" hawk and was a key architect of the Iraq war. Mr Bush described Mr Wolfowitz as a "compassionate, decent man". French and German ministers were guarded in their reaction, while Sweden's foreign minister said she was sceptical about the nomination. "The enthusiasm in old Europe is not exactly overwhelming," said German Aid and Development Minister Heidemarie Wieczorek-Zeul. French President Jacques Chirac "took note" of the nomination, a spokesman said. But UK Foreign Secretary Jack Straw backed Mr Wolfowitz, calling him "very distinguished and experienced internationally". Japan's Prime Minister Junichiro Koizumi also stood by the nomination, his spokesman said. In addition to Mr Chirac and Mr Koizumi, UK Prime Minister Tony Blair, German Chancellor Gerhard Schroeder and South African President Thabo Mbeki all received calls, the Associated Press reports. The organisation, which has 184 members and is traditionally headed by an American, is responsible for leading global efforts to promote economic development and reduce poverty. Aid agencies and development experts lined up to criticise the nomination. Joseph Stiglitz, Nobel Prize winner and a former World Bank chief economist, said: "Choosing the right general in the war against poverty will not assure victory, but choosing the wrong one surely increases the chances of failure." Greenpeace, ActionAid, and Oxfam were among other critics. But World Bank critic Allan Meltzer, who chaired a US congressional committee on the bank in 2000, said Mr Wolfowitz was well qualified for the job. "What the bank needs is focus: how many children are inoculated against measles every year? What have we done to bring water to the villages?" Current World Bank president James Wolfensohn will leave in June after 10 years, despite seeking re-appointment. The 'Wolf' has been shown the path to the henhouse. It's hard to imagine peaceful development under his leadership. The view in Washington is that the White House would not have announced the president's choice unless sufficient support had already been garnered behind the scenes, our correspondent says.